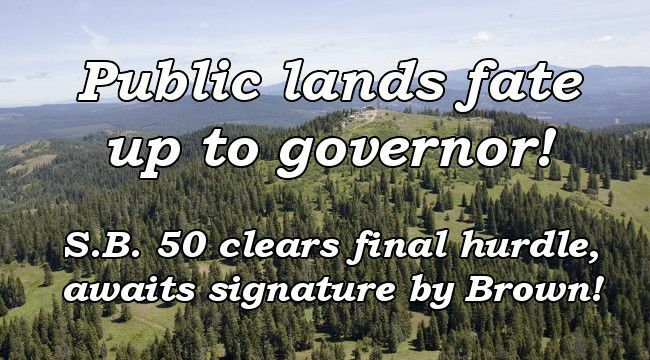 Public lands measure awaits governor's pen! California's S.B. 50, The Public Lands Protection Act, is now just a single remaining step away from becoming law! On Sept. 14 the measure to erect a barrier against the giveaway of our priceless public lands to extractive industries passed its final procedural vote in the state Senate. The vote was 28-12. Six days later the bill was delivered to Gov. Jerry Brown for his signature or veto. If you wrote to your Assemblymember— or otherwise supported our recent efforts to advance S.B. 50— thank you! We're almost there! Please take a moment right now to tell Gov. Brown that you are counting on him to sign S.B. 50! California is home to some 45 million acres of federal lands and waters, not to mention 18 national forests covering about nine million of those acres. But as you know, they are under heavy assault from the Trump administration, which has been supporting divestiture of these lands from U.S. ownership to state or private owners who would not or could not manage them properly and in accordance with environmental laws. Our priceless natural heritage would face selloff to highest bidders in the timber, oil and gas, ranching, mining, and other industries. We cannot let this happen! Let's finish the job and make S.B. 50 the law! Write to Gov. Brown today, urging him to sign the bill!